The features this house has is central heating and cooling nice outdoor decking and sitting area has an outdoor spa which can be connected i only use it in summer is a clean house. 10 year old house very nice house, next to Creek and station. Perfectly suited for a couple. 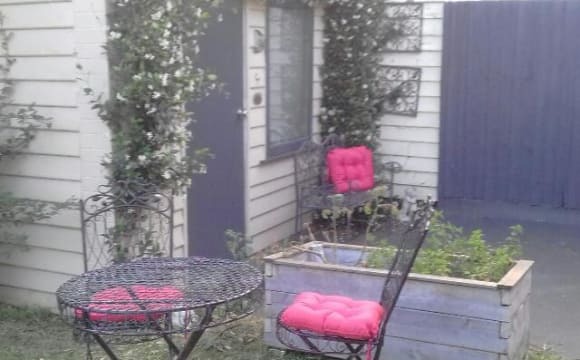 Private and quiet fully contained upstairs studio with balcony, 150 metres access to route 58 tram taking you direct to Melbourne Uni and the CBD. Fully furnished and all utilities included. Private side drive access, light filled very cosy living space. 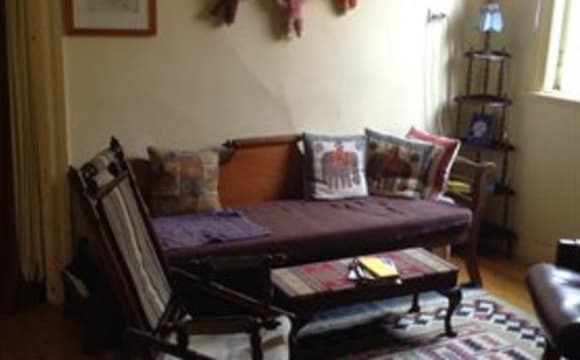 This is a very sweet, companionable Edwardian house with an awesome calm atmosphere and lovely gardens. I've lived here more than ten years because it is such a great home to live in. Huge House with lots of space! (A back yard and all that good stuff) We're looking for a new housemate as our old one has moved out of Melbourne! The rent including bills is approximately $720 per month which works out to about $180/week. The bathroom situation is pretty good, there is 1 master bathroom with a bath, shower, toilet, bidet (we haven't used it? ), and another colder smaller bathroom with a toilet and shower. All bills are split between the housemates, and we'd also want you to be willing to go on the lease if you like the house (and us). Internet is important, and we have HFC (100/2) cable. For those cold winter months there is central heating, and always seemingly enough hot water. Onto the Bedroom The bedroom is about 4.5 x 4.5 and is front facing on the house! The carpet is a little ugly, but the room is very quiet, with a window and some really good curtains to block out the sunshine. 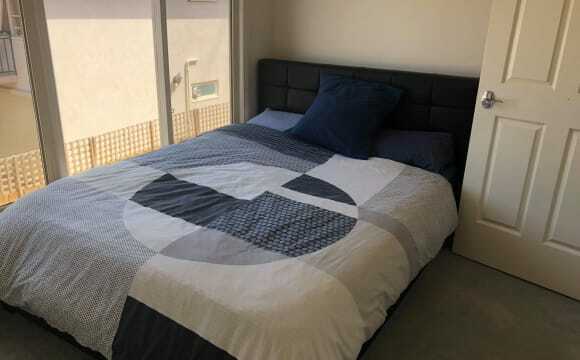 Master bedroom for rent in Brunswick🏠 west. ✅minimum 3months stay. ✅Notice of 3weeks before moving out,bond required $1000+2wks rent in advance. ✅1min away from bus/tram stops. 🚍🚊 ✅Prefer females only. 🙋‍♀️ ✅Fully furnished, very accessible and safe neighborhood. ✅Cafes and restaurants and shops (Asian shops too) walking distance. 👀Looking for someone who is studying or working full-time, tidy, respectful and pays bills on time. Pm me if u need more info. Thanks 😊 No couples 💑 , but can consider 2 females👭 (students/working fulltime)$175/pp per week. You can take the tram 58 straight to the city or via train or bus either to Essendon, Moreland or Royal park station. Safe and secure apartment. 15mins away from QV market, Royal Melbourne hospital, Peter Mac cancer centre. This house is located just off Bell street, with plenty of transport options with the 58 tram and Coburg station being withing walking distance. Coles and IGA are both a 5-10 minute walk away, but there is plenty of parking in an empty lot next to us, so great for someone who has a car. There is plenty of bench space in the kitchen, perfect for cooking up a storm. The house is fully furnished, although the room comes empty. The room itself is large, fitting a wardrobe, queen sized bed, chest of draws and desk all comfortably. You would be taking the lease over from Sophie, which is great if you would like some security! We have a great relationship with the landlord, who is really lovely. WALK TO THE TRAIN STATION Two level home in a quiet location featuring: - Open-plan living/dining area - Well-appointed kitchen with stone benchtops, stainless steel cooking appliances and dishwasher - Split-system heating/cooling downstairs - Ducted vacuum - Alarm system - Hardwood floors - European laundry - Low maintenance private North-facing courtyard garden with decking Walking distance to Glenbervie Station, it's also close to Napier Street cafe scene and popular shopping precincts, parkland, Moonee Ponds Creek Trail and Citylink. Rent includes bills (gas, water, electricity and internet). The bedroom is of large size, with a large built in robe. This bedroom also has its own Ensuite. This bedroom is downstairs. Parking: there is a council restriction on street parking during business hours Mon-Fri so this place would suit someone who drives to work or doesnt have a car. Weekends and overnight have no restrictions so you can park on the street. The driveway and garage space are taken up by current housemates. The property does not allow for pets. 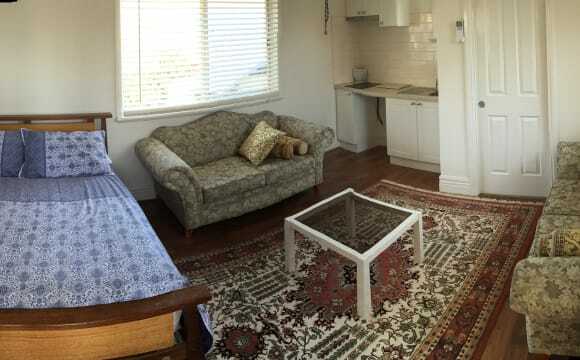 Our 3br weatherboard home is spacious, homely and on a quiet neighbourhood street. The room is the biggest of the house and comes unfurnished with built in robes, a big bay window and timber floorboards. Excellent selfie lighting as well. Netflix &amp; Stan accounts are communal and we also have a really great heater &amp; air con, as well as fans in every room. Large room 12 x 14 feet, suitable for a couple. Big screen TV. Most mod cons except dishwasher. Large backyard, suitable for BBQs, may need some simple pet-proofing. 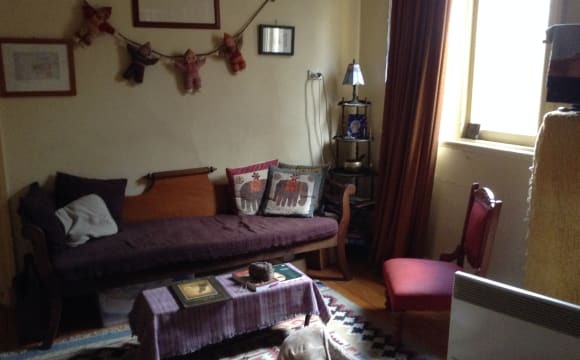 The place heats and cools slowly, but has air con for bad days. Very close to 58 Tram. Easy walk/ride to Coburg rail station, to-city cycle track and Sydney Rd shopping &amp; music. On east-west Bell St bus routes. Hi! 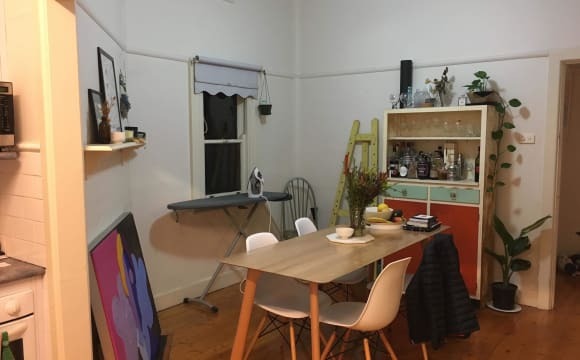 I'm Rachel, and for the past nine months I've lived in this gorgeous sharehouse in Pascoe Vale. I'm very sad to move away as this has been my dream house, but hopefully you will find it just as lovely as I have! The house is situated on a quiet residential street just up the hill from Pascoe Vale train station - far enough away that you don't hear the train horns, but close enough that you can walk there in a pinch. We also live about a 300 metre walk away from Cumberland Road and its bank of shops, which includes a fair few coffee shops, bottleshops, a laundromat, bakeries etc. The house is also a few minutes drive away from the Coburg North Coles, Officeworks, Bunnings etc on Gaffney Street. The room itself is spacious - big enough for me to fit my double bed and a desk in! - has a walk-in wardrobe with mirrored doors, carpeted floors and windows equipped with blinds. There is a toilet right across the hall and a large bathroom (pictured) just to the right of the room. The following is what the real estate agency has written about the property, summed up better than what I could say about it: "This striking contemporary townhouse set at the front on a block of four is certain to make an impression with its stylish interior and enviable inner-urban convenience. Filled with natural light, the family home features three generous bedrooms master complete with walk in robes and ensuite comprising shower only and toilet, the remaining bedrooms have built in robes and are serviced by a centrally located bathroom comprising separate shower, bath and toilet, spacious lounge/dining room and superb adjoining gourmet kitchen complete with gas cooktop and stainless steel appliances and dishwasher along with stone benchtops. Other stand-out features include private courtyard off the living area, dual zone ducted heating and refrigerated air conditioning, polished floorboards downstairs with carpet upstairs, ducted vacuum, under stairs storage, downstairs powder room along with a small study area and separate living zone upon entry. Security is provided by alarm upon entry as well as video intercom, laundry, Infinity hot water system plus remote access for the one car garage with internal access along with a further off street car space for one car. 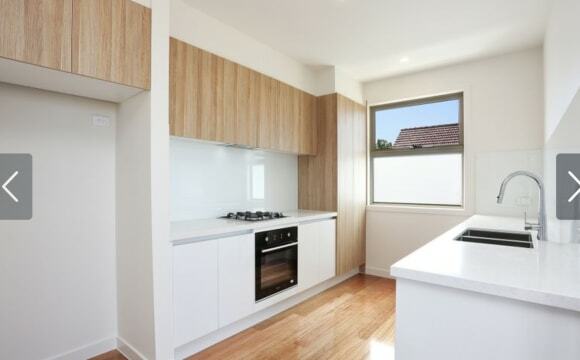 The property is close to Pascoe Vale Primary School, St Olivers Primary School and Strathmore Secondary College. 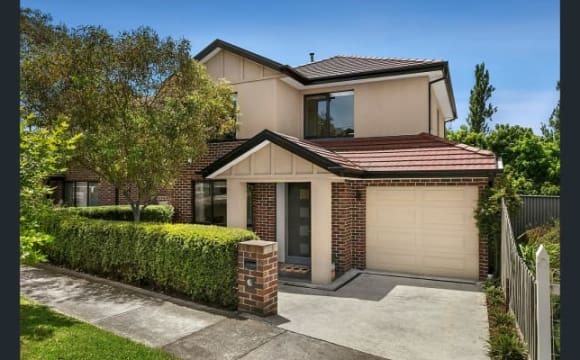 The property is also close to coffee shops and local shops along Cumberland Road and Gaffney Street with excellent access to Citylink, Western Ring Road and Pascoe Vale Train Station." This Ad is for TWO ADJOINING ROOMS FOR AN INDEPENDENT WOMAN OR COUPLE. One room has substantial over-head and built-in storage space and a north-facing sunny-side window; across the entrance hallway is another spacious room with wide East-facing Windows opening onto your own private garden porch. Both are lovely rooms. This is A VEGETARIAN/PESCATARIAN household. 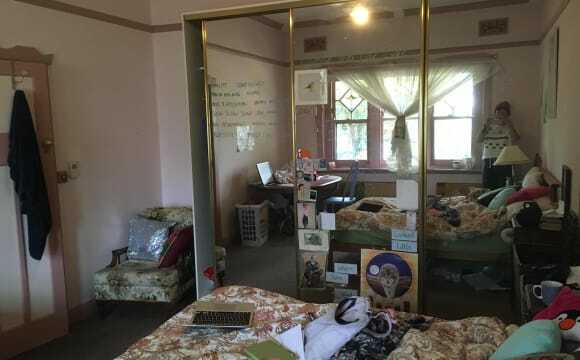 Rent is $320/week for the two rooms with $280/month/person for utilities and shared household expenses: toilet paper, cleansers, etc., plus $1000 Refundable Bond is required. We share households tasks to maintain a fresh, clean environment; if unable to contribute to this process then an extra $200/month cleaning charge is added. A flourishing garden surrounds this charming Edwardian home that is remarkably cool in summer and easily warmable in winter; it's well insulated and well equipped for comfortable living. We have a substantial storeroom in the back garden, also a sweet cubby-house for resident or visiting children. The distinguished cat who lives here is a lounge-lizard and I'm thinking of finding an abandoned kitten. Private and secure. Clean, comfortable, relaxing and quiet. Large backyard to relax in. Close to cafes, gyms, transport, parks, citylink and Moonee Ponds Creek Trail. On the bike path. Has queen bed, sitting area with television, heating/cooling, kitchen with oven, toaster, dishwasher, fridge, kettle, jaffle maker, blender, utensils plates cups etc. Separate bathroom with washing machine, towels provided. As rent includes bills, an extra $30 per week for couples. 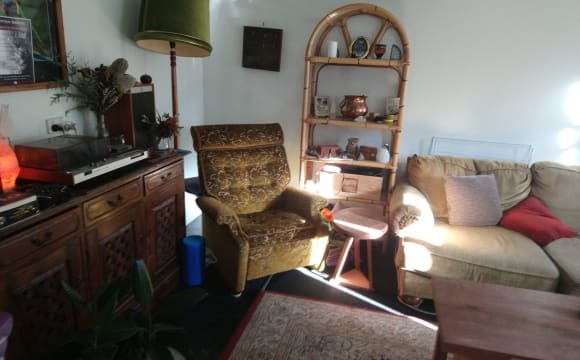 The room up for grabs is a detached bungalow with a nice sized lounge with a split system aircon/ heater and the bedroom comfortably fits a queen bed and has a built in robe and carpet all throughout. There is also a small bathroom with toilet shower and vanity. It will come without any furniture. The House its self is a weatherboard which has been brought up with a more modern kitchen and bathroom, it has a mostly tiled floor apart the lounge room being hardwood. The stove is a nice big gas cooktop and an electric oven underneath. There is ducted heating in the main house. There is a little bit of a garden in the front and a garden bed in the back that you could plant stuff if you have a green thumb. Half the backyard in concrete and the other lawn. The neighbours have some apple and lemon trees hanging over the back fence that supply yummy treats! Bills are shared evenly and we find it works well if one person takes each then we add it to splitwise and work out if anyone is out of pocket every few months or so. The room is ideal for someone who likes a bit of a private retreat while still happy to interact and be social here and there. There is a bike path along Ohea street that takes you to the upfield bike path in less than 5 mins. This is a 3 story house; very spacious and located in a quiet neighbourhood. The balcony looks out onto the neighbourhood and you'll be able to experience some amazing sunsets. The train station is 2 mins walk down the road and bus stop for route 561 is also 2 mins away. Foodworks, pharmacy, cafes and hair salons are located right next to the station. Coles, Woolworths and Kmart are 5 mins drive. Garage available. On street parking also available for a limited time each day (2 hrs). There are three bedrooms available and 3 bathrooms (all shared). There will be a transfer fee for the lease. Bills (electricity, water, internet) are shared equally among flatmates. Also, a side note, the bond is $1453. I didn't have an option to enter it manually so I just chose the maximum. It is NOT $904. Please feel free to contact me for any further questions or for an inspection. It’s chilled and relaxed, Awesome people and great vibes! Animal friendly and can send more photos through if your keen! Looking for someone who is happy to socialise and can move in by the 27th! One girl and two guys currently live there and they are all amazing people! Hi, one of our original housemates is moving out to live with her partner so we are looking for someone to join our house. We have been in the house 2 years now and about to resign for another 12 months minimum. We have a large 4 bedroom 3 bathroom house with 2 living areas with a small yard. The room available shares the bathroom with one other and is possibly the biggest room in the house with lots of natural light located at the front of the house. We are looking for someone who wants to be a part of our house, share a drink after work on a Friday or weekend if around, happy to pull their weight with cleaning and keeping the house in order but also have a life of their own outside the house. A love of dogs is an absolute must as we have a Jack Russell pooch the basically runs the house (very much an indoor dog!) We have foxtel and unlimited internet that is additional to rent and we split all bills eventually. The house is basically fully furnished apart of the few things that will be going with the current housemate (fridge, dryer, dining table) so if you have any of these that’s a positive if not we will be replacing them anyways. We are perfectly located with a 2 minute walk from the Glenbervie train station. Looking for a considerate mature person for a non-party house. Prefer a non-smoker who is looking to stay at least 12 months. Room is available on 12th May. NOTE: There is no lounge so the place is most likely suited to working/studying people who like to have people around but not too much in their faces :) The available room is large, clean, and fully furnished. Very close (35 mins travel or less) by public transport are Brunswick, Brunswick East, Parkville, Flemington, North Melbourne, Moonee Ponds, Essendon, Pascoe Vale South, Melbourne City Centre. 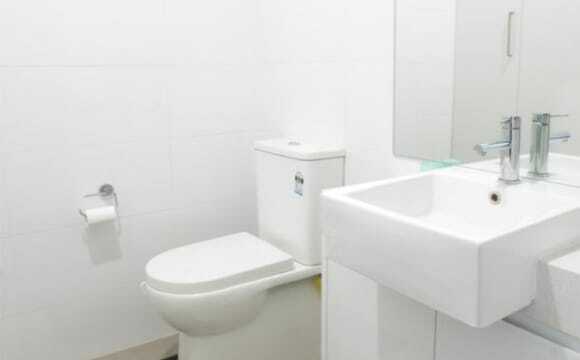 Included in the rent is a cleaner who comes every two weeks to clean the common areas. The house is close to 58 and 59 tram routes and a few hundred metres from a dedicated bike path to the city (Moonee Ponds Creek Trail). It's also near freeway on-ramps and off-ramps (but far enough away from the freeway that you can literally barely hear it). There is also a bus stop for the 503 bus a few doors down (It runs east-west Mon to Sat. 10mins bus ride to the east is Anstey Train station and 10 mins bus ride to the west is Essendon Train Station). Internet is stable 50 mbps NBN with good strength Wifi. Share all utility bills (budget for roughly about $20 per week in summer and roughly $30 per week in winter; depending on amount of water/gas/power used) . There is a spacious kitchen, two bathrooms, 2 gas heated showers with good pressure and two toilets (one separate) so there are plenty of facilities for the 5 rooms here. NOTE: People who have fully filled out their listing, including all details about themselves, will be looked on more favourably!